Elinor Claire "Lin" Ostrom (née Awan; August 7, 1933 – June 12, 2012) was an American political economist whose work was associated with the New Institutional Economics and the resurgence of political economy. In 2009, she was awarded the Nobel Memorial Prize in Economic Sciences for her "analysis of economic governance, especially the commons", which she shared with Oliver E. Williamson. To date, she remains the only woman to win the Nobel Prize in Economics. After graduating with a B.A. and Ph.D. from UCLA, Ostrom lived in Bloomington, Indiana, and served on the faculty of Indiana University, with a late-career affiliation with Arizona State University. She was Distinguished Professor at Indiana University and the Arthur F. Bentley Professor of Political Science and co-director of the Workshop in Political Theory and Policy Analysis at Indiana University, as well as research professor and the founding director of the Center for the Study of Institutional Diversity at Arizona State University in Tempe. She was a lead researcher for the Sustainable Agriculture and Natural Resource Management Collaborative Research Support Program (SANREM CRSP), managed by Virginia Tech and funded by USAID. Beginning in 2008, she and her husband Vincent Ostrom advised the journal Transnational Corporations Review. Elinor Claire Awan was born in Los Angeles, California as the only child of Leah Hopkins, a musician, and Adrian Awan, a set designer. Her parents separated early in her life, and Elinor lived with her mother most of the time. She attended a Protestant church with her mother and often spent weekends with her father's Jewish family. Growing up in the post-Depression era to divorced artisans, Ostrom described herself as a "poor kid." Her major recreational activity was swimming, where she eventually joined a swimming team and swam competitively until she started teaching swimming to earn funds to help put herself through college. Ostrom grew up across the street from Beverly Hills High School, which she attended, graduating in 1951. She regarded this as fortunate, for the school had a very high rate of college admittance. During Ostrom's junior year, she was encouraged to join the debate team. Learning debate tactics had an important impact on her ways of thinking. It allowed her to realize there are two sides to public policy and it is imperative to have quality arguments for both sides. As a high school student, Elinor Ostrom had been discouraged from studying Trigonometry, as girls without top marks in Algebra and Geometry were not allowed to take the subject. No one in her immediate family had any college experience, but seeing that 90% of students in her high school attended college, she saw it as the "normal" thing to do. Her mother did not wish for her to attend college, seeing no reason for it. She attended UCLA, receiving a B.A. (with honors) in political science at UCLA in 1954. By attending multiple summer session and extra classes throughout semesters, she was able to graduate in three years. She worked at the library, dime store, and bookstore in order to pay for her fees, which were $50 per semester. She married a classmate, Charles Scott, and worked at General Radio in Cambridge, Massachusetts while Scott attended Harvard Law School. They divorced several years later when Ostrom began contemplating a PhD. After graduation, she had trouble finding a job because employers presumed that she was only looking for jobs as a teacher or secretary. She began a job as an Export Clerk after taking a correspondence course for shorthand, which she later found to be helpful when taking notes in face-to-face interviews on research projects. After a year, she obtained a position as Assistant Personnel Manager in a business firm that had never before hired a woman in anything but a secretarial position. This job inspired her to think about attending graduate-level courses and eventually applying for a research assistantship and admission to a Ph.D. program. Lacking trigonometry from high school, she was consequently rejected for an economics PhD at UCLA. She was admitted to UCLA's graduate program in political science, where she was awarded an M.A. in 1962 and a PhD in 1965. She married political scientist Vincent Ostrom in 1963, whom she met while assisting his research on water resource governance in Southern California. The teams of graduate students she was involved with were analyzing the political economic effects of a group of groundwater basins in Southern California. Specifically, Ostrom was assigned to look at the West Basin. She found it is very difficult to manage a common-pool resource when it is used between individuals. In 1961 Vincent Ostrom, Charles Tiebout and Robert Warren published "The organization of government in metropolitan areas," which would go on to be an influential article and introduced themes that would be central to the Ostroms' work. However, the article aggravated a conflict with UCLA's Bureau of Governmental Research because, counter to the Bureau's interests, it advised against centralization of metropolitan areas in favor of polycentrism. This conflict prompted the Ostroms to leave UCLA. They moved to Bloomington, Indiana in 1965, when Vincent accepted a political science professorship at Indiana University. She joined the faculty as Visiting Assistant Professor. The first course she taught was American Government at 7:30. Ostrom was richly informed by fieldwork, both her own and that of others. During her PhD at the University of California, Los Angeles, she spent years studying the water wars and pumping races going on in the 1950s in her own dry backyard. In contrast to the prevailing rational-economic predictions of Malthusianism and the tragedy of the commons, she showed cases where humans were not trapped and helpless amid diminishing supplies. In her book Governing the Commons, she draws on studies of irrigation systems in Spain and Nepal, mountain villages in Switzerland and Japan, and fisheries in Maine and Indonesia. "Lin, up until the very end, was heavily involved in our preparations for the Nobel Laureate dialogues on global sustainability we will be hosting in Rio 17th and 18th of June during the UN Rio+20 Earth Summit. In the end, she decided she could not come in person, but was contributing sharp, enthusiastically charged, inputs, in the way only she could." It was long unanimously held among economists that natural resources that were collectively used by their users would be over-exploited and destroyed in the long-term. Elinor Ostrom disproved this idea by conducting field studies on how people in small, local communities manage shared natural resources, such as pastures, fishing waters, and forests. She showed that when natural resources are jointly used by their users, in time, rules are established for how these are to be cared for and used in a way that is both economically and ecologically sustainable. She was senior research director of the Vincent and Elinor Ostrom Workshop in Political Theory and Policy Analysis, Distinguished Professor and Arthur F. Bentley Professor of Political Science in the College of Arts and Sciences, and professor in the School of Public and Environmental Affairs. Ostrom's early work emphasized the role of public choice on decisions influencing the production of public goods and services. Among her better known works in this area is her study on the polycentricity of police functions in Indianapolis. Caring for the commons had to be a multiple task, organised from the ground up and shaped to cultural norms. It had to be discussed face to face, and based on trust. Dr. Ostrom, besides poring over satellite data and quizzing lobstermen herself, enjoyed employing game theory to try to predict the behaviour of people faced with limited resources. In her Workshop in Political Theory and Policy Analysis at Indiana University—set up with her husband Vincent, a political scientist, in 1973—her students were given shares in a national commons. When they simply discussed what they should do before they did it, their rate of return from their "investments" more than doubled. Her later, and more famous, work focused on how humans interact with ecosystems to maintain long-term sustainable resource yields. Common pool resources include many forests, fisheries, oil fields, grazing lands, and irrigation systems. She conducted her field studies on the management of pasture by locals in Africa and irrigation systems management in villages of western Nepal (e.g., Dang Deukhuri). Her work has considered how societies have developed diverse institutional arrangements for managing natural resources and avoiding ecosystem collapse in many cases, even though some arrangements have failed to prevent resource exhaustion. Her work emphasized the multifaceted nature of human–ecosystem interaction and argues against any singular "panacea" for individual social-ecological system problems. The Workshop in Political Theory and Policy Analysis was meant to utilize diverse scholars throughout economics, political science, and other fields to collaborate and attempt to understand how institutional arrangements in a diverse set of ecological and social economic political settings affected behavior and outcomes.The goal was not to fly around the world collecting data, rather it is to create a network of scholars who live in particular areas of the world and had strong interests in forest conditions and forest policy conducted the studies. Ostrom identified eight "design principles" of stable local common pool resource management: She also discussed the eight "design principles" on Big Think. In the case of larger common-pool resources, organization in the form of multiple layers of nested enterprises, with small local CPRs at the base level. These principles have since been slightly modified and expanded to include a number of additional variables believed to affect the success of self-organized governance systems, including effective communication, internal trust and reciprocity, and the nature of the resource system as a whole. Ostrom and her many co-researchers have developed a comprehensive "Social-Ecological Systems (SES) framework", within which much of the still-evolving theory of common-pool resources and collective self-governance is now located. According to the Norwegian Institute for Urban and Regional Research, "Ostrom cautioned against single governmental units at global level to solve the collective action problem of coordinating work against environmental destruction. Partly, this is due to their complexity, and partly to the diversity of actors involved. Her proposal was that of a polycentric approach, where key management decisions should be made as close to the scene of events and the actors involved as possible." Ostrom helped disprove the idea held by economists that natural resources would be over-used and destroyed in the long run. Elinor Ostrom disproved this idea by conducting field studies on how people in small, local communities manage shared natural resources, such as pastures, fishing waters in Maine and Indonesia, and forests in Nepal. She showed that when natural resources are jointly used by their users, in time, rules are established for how these are to be cared for and used in a way that is both economically and ecologically sustainable. A resource arrangement that works in practice can work in theory. Ostrom was a member of the United States National Academy of Sciences and president of the American Political Science Association and the Public Choice Society. In 1999, she became the first woman to receive the prestigious Johan Skytte Prize in Political Science. Ostrom was awarded the Frank E. Seidman Distinguished Award for Political Economy in 1998. Her presented paper, on "The Comparative Study of Public Economies", was followed by a discussion among Kenneth Arrow, Thomas Schelling and Amartya Sen. She was awarded the John J. Carty Award from the National Academy of Sciences in 2004, and, in 2005, received the James Madison Award by the American Political Science Association. In 2008, she became the first woman to receive the William H. Riker Prize in political science; and, the following year, she received the Tisch Civic Engagement Research Prize from the Jonathan M. Tisch College of Citizenship and Public Service at Tufts University. In 2010, the Utne Reader magazine included Ostrom as one of the "25 Visionaries Who Are Changing Your World". She was named one of Time magazine's "100 Most Influential People in the World" in 2012. The International Institute of Social Studies (ISS) awarded its Honorary Fellowship to her in 2002. In 2008 she was awarded an honorary degree, doctor honoris causa, at the Norwegian University of Science and Technology. Telephone interview with Elinor Ostrom. In 2009, Ostrom became the first woman to receive the prestigious Nobel Memorial Prize in Economic Sciences. "The announcement of her prize caused amazement to several economists," a Princeton economics professor said, "including some prominent colleagues who had never even heard of her." The Royal Swedish Academy of Sciences cited Ostrom "for her analysis of economic governance", saying her work had demonstrated how common property could be successfully managed by groups using it. Ostrom and Oliver E. Williamson shared the 10-million Swedish kronor (€990,000; $1.44 million) prize for their separate work in economic governance. As she had done with previous monetary prizes, Ostrom donated her award to the Workshop she helped to found. The Royal Swedish Academy of Sciences said Ostrom's "research brought this topic from the fringe to the forefront of scientific attention...by showing how common resources – forests, fisheries, oil fields or grazing lands – can be managed successfully by the people who use them rather than by governments or private companies". Ostrom's work in this regard challenged conventional wisdom, showing that common resources can be successfully managed without government regulation or privatization. Ostrom was diagnosed with pancreatic cancer in October 2011. During the final year of her life, she continued to write and lecture, giving the Hayek Lecture at the Institute of Economic Affairs just eleven weeks before her death. She died at 6:40 a.m. Tuesday, June 12, 2012, at IU Health Bloomington Hospital at the age of 78. On the day of her death, she published her last article, "Green from the Grassroots," in Project Syndicate. Indiana University president Michael McRobbie wrote: "Indiana University has lost an irreplaceable and magnificent treasure with the passing of Elinor Ostrom". Her Indiana colleague Michael McGinnis commented after her death that Ostrom donated her share of the $1.4 million Nobel award money to the Workshop—the biggest, by far, of several academic prizes with monetary awards that the Ostroms had given to the center over the years. Her husband Vincent died 17 days later from complications related to cancer. He was 92. Ostrom, Elinor (1990). Governing the Commons: The Evolution of Institutions for Collective Action. Cambridge, UK: Cambridge University Press. ISBN 9780521405997. Ostrom, Elinor; Schroeder, Larry; Wynne, Susan (1993). Institutional incentives and sustainable development: infrastructure policies in perspective. Boulder: Westview Press. ISBN 9780813316192. Ostrom, Elinor; Walker, James; Gardner, Roy (1994). Rules, games, and common-pool resources. Ann Arbor: University of Michigan Press. ISBN 9780472065462. Ostrom, Elinor; Walker, James (2003). Trust and reciprocity: interdisciplinary lessons from experimental research. New York: Russell Sage Foundation. ISBN 9780871546470. Ostrom, Elinor (2005). Understanding institutional diversity. Princeton: Princeton University Press. ISBN 9780691122380. Ostrom, Elinor; Kanbur, Ravi; Guha-Khasnobis, Basudeb (2007). Linking the formal and informal economy: concepts and policies. Oxford: Oxford University Press. ISBN 9780199237296. Ostrom, Elinor; Hess, Charlotte (2007). Understanding knowledge as a commons: from theory to practice. Cambridge, Massachusetts: MIT Press. ISBN 9780262516037. Ostrom, Elinor (2009), "Engaging with impossibilities and possibilities", in Kanbur, Ravi; Basu, Kaushik (eds. ), Arguments for a better world: essays in honor of Amartya Sen | Volume II: Society, institutions and development, Oxford New York: Oxford University Press, pp. 522–41, ISBN 9780199239979. Ostrom, Elinor; Crawford, Sue E. S. (September 1995). "A grammar of institutions". American Political Science Review. 89 (3): 582–600. doi:10.2307/2082975. JSTOR 2082975. Ostrom, Elinor (March 1998). "A behavioral approach to the rational choice theory of collective action: Presidential address, American Political Science Association, 1997". American Political Science Review. 92 (1): 1–22. doi:10.2307/2585925. JSTOR 2585925. Ostrom, Elinor (June 2010). "Beyond markets and states: polycentric governance of complex economic systems". American Economic Review. 100 (3): 641–72. doi:10.1257/aer.100.3.641. Pdf version. Co-production of public services by service users and communities. ^ "No Panaceas! Elinor Ostrom talks with Fran Korten". Shareable: Civic System. March 18, 2010. Retrieved February 20, 2011. ^ Janssen, M. A. (2012). "Elinor Ostrom (1933–2012)". Nature. 487 (7406): 172. doi:10.1038/487172a. PMID 22785305. ^ Wilson, R. K. (2012). "Elinor Ostrom (1933–2012)". Science. 337 (6095): 661–61. doi:10.1126/science.1227725. PMID 22879496. ^ Aligica, Paul Dragos; Boettke, Peter (2010). "Ostrom, Elinor". The New Palgrave Dictionary of Economics (Online ed.). ^ "Nobel Prize Awarded Women". Retrieved January 19, 2016. ^ "Elinor Ostrom building for Nijmegen School of Management". Radboud University (in Dutch). Retrieved February 3, 2018. ^ "Researcher for Virginia Tech program wins Nobel Prize". Virginia Tech. Retrieved January 2, 2011. ^ a b c d e Leonard, Mike (December 6, 2009). "Nobel winner Elinor Ostrom is a gregarious teacher who loves to solve problems". The Herald-Times. Bloomington, Indiana. Archived from the original on April 15, 2015. Retrieved April 15, 2015. ^ a b "Elinor Ostrom". The Telegraph. London. June 13, 2012. Retrieved April 15, 2015. ^ a b c d Wall, Derek (2014). The Sustainable Economics of Elinor Ostrom: Commons, Contestation and Craft. Routledge. ^ "The story of non-economist Elinor Ostrom". The Swedish Wire. December 9, 2009. Retrieved June 12, 2010. ^ "Elinor Ostrom". The Economist. June 30, 2012. Retrieved August 30, 2012. ^ a b c d e f g "Elinor Ostrom - Biographical". www.nobelprize.org. Retrieved March 3, 2018. ^ a b c d Vlad, Tarko (2017). Elinor Ostrom : an intellectual biography. London. ISBN 9781783485888. OCLC 965120114. ^ a b McKay, Bonnie J.; Bennett, Joan (2014). Biographical Memoir of Elinor Ostrom (1933–2012) (PDF). National Academy of Sciences. Retrieved April 15, 2015. ^ Harford, Tim (August 30, 2013). "Do You Believe in Sharing?". Financial Times. Archived from the original on July 15, 2014. Retrieved April 15, 2015. ^ Elinor Ostrom. http://www.ubs.com/microsites/nobel-perspectives/en/elinor-ostrom.html in UBS Nobel Perspectives interview, 2009. ^ Woo, Elaine (June 13, 2012). "Elinor Ostrom dies at 78; first woman to win Nobel in economics". Los Angeles Times. Retrieved April 15, 2015. ^ a b Zagorski, Nick (2006). "Profile of Elinor Ostrom". Proceedings of the National Academy of Sciences. 103 (51): 19221–23. doi:10.1073/pnas.0609919103. PMC 1748208. PMID 17164324. ^ "Elinor Ostrom". The Economist. June 30, 2012. Retrieved March 3, 2018. ^ "The Workshop in Political Theory and Policy Analysis". Indiana.edu. Archived from the original on October 7, 2009. Retrieved October 13, 2009. ^ Mitchell, W. C. (1988). "Virginia, Rochester, and Bloomington: Twenty-five years of public choice and political science". Public Choice. 56 (2): 101–19. doi:10.1007/BF00115751. ^ a b Arrow, Kenneth J.; Keohane, Robert O.; Levin, Simon A. (August 14, 2012). "Elinor Ostrom: An uncommon woman for the commons". Proceedings of the National Academy of Sciences. 109 (33): 13135–13136. doi:10.1073/pnas.1210827109. ISSN 0027-8424. PMC 3421197. ^ "Elinor Ostrom - Facts". www.nobelprize.org. Retrieved March 5, 2019. ^ "Elinor Ostrom, 2009 Nobel Laureate in Economic Sciences: Indiana University". www.elinorostrom.com. Retrieved March 3, 2018. ^ "Polycentricity and Local Public Economies". Archived from the original on April 3, 2013. Retrieved February 8, 2013. ^ "Beyond the tragedy of the commons". Stockholm Whiteboard Seminars. April 3, 2009. Retrieved March 23, 2013. ^ Ostrom, Elinor (1990). Governing the Commons: The Evolution of Institutions for Collective Action. Cambridge University Press. ISBN 978-0-521-40599-7. ^ Poteete, Janssen; Elinor Ostrom (2010). Working Together: Collective Action, the Commons, and Multiple Methods in Practice. Princeton University Press. ^ Ostrom, E. (2009). "A General Framework for Analyzing Sustainability of Social-Ecological Systems". Science. 325 (5939): 419–22. doi:10.1126/science.1172133. PMID 19628857. ^ Vedeld, Trond. 2010, February 12. "A New Global Game – And How Best to Play It," Archived June 24, 2016, at the Wayback Machine The NIBR International Blog. ^ Fennell, Lee Anne (March 2011). "Ostrom's Law: Property rights in the commons". International Journal of the Commons. 5 (1): 9–27. doi:10.18352/ijc.252. ISSN 1875-0281. Retrieved February 16, 2015. ^ "The Johan Skytte Prize in Political Science – Prize Winners". Archived from the original on March 14, 2012. ^ "Frank E. Seidman Award: Acceptance Paper". Archived from the original on February 12, 2013. Retrieved February 8, 2013. ^ "John J. Carty Award for the Advancement of Science". National Academy of Sciences. Archived from the original on December 29, 2010. Retrieved February 25, 2011. ^ "Elinor Ostrom: The Commoner". Utne Reader. Retrieved October 19, 2010. 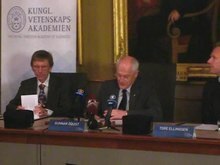 ^ "Honorary doctors at NTNU". Norwegian University of Science and Technology. ^ "A Candle for the Dismal Science". The Attic. Retrieved July 14, 2018. ^ "First woman wins economics Nobel". BBC News. October 12, 2009. Retrieved April 15, 2015. ^ Arrow, Kenneth; Keohane, Robert O.; Levin, Simon A. (2012). "Elinor Ostrom: An Uncommon Woman for The Commons". Proceedings of the National Academy of Sciences. 109 (33): 13135–36. doi:10.1073/pnas.1210827109. PMC 3421197. ^ Rampell, Catherine (June 13, 2012). "Elinor Ostrom, Winner of Nobel in Economics, Dies at 78". New York Times. Retrieved April 15, 2015. ^ Daniel Cole (June 13, 2012). "obituary". London: Guardian. Retrieved March 23, 2013. ^ Stokes, Kyle (June 13, 2012). "How IU Nobel Laureate Elinor Ostrom Changed the World". StateImpact. Indiana Public Media. Retrieved March 23, 2013. ^ Jessop, Bob. "Introduction to Elinor Ostrom" (PDF). Beyond Ostrom. Retrieved April 15, 2015. ^ Ostrom, Elinor (June 12, 2012). "Green from the Grassroots". Project Syndicate. ^ "Elinor Ostrom, Only Female Nobel Laureate in Economics, Dies". Wall Street Journal. June 12, 2012. ^ "Distinguished Indiana University scholar Vincent Ostrom dies: IU News Room: Indiana University". newsinfo.iu.edu. Retrieved March 3, 2018. Aligica, Paul Dragos (2008). "Ostrom, Vincent and Elinor (1919-and 1933-)". In Hamowy, Ronald (ed.). Ostrom, Vincent and Elinor (1919– and 1933– ). The Encyclopedia of Libertarianism. Thousand Oaks, CA: SAGE; Cato Institute. p. 368. doi:10.4135/9781412965811.n225. ISBN 978-1-4129-6580-4. LCCN 2008009151. OCLC 750831024. Aligica, Paul Dragos; Boettke, Peter (2009). Challenging Institutional Analysis and Development: The Bloomington School. Routledge. ISBN 978-0-415-77820-6. Locher, Fabien. "Third World Pastures. The Historical Roots of the Commons Paradigm (1965-1990)". Quaderni Storici. 2016/1: 303–333. Auer, Matthew (August 2014). "Collective Action and the Evolution of Social Norms: The Principled Optimism of Elinor Ostrom". Journal of Natural Resources Policy Research. 6 (4): 265–71. doi:10.1080/19390459.2014.941177. Wikimedia Commons has media related to Elinor Ostrom. Beyond Markets and States: Polycentric Governance of Complex Economic Systems, 2009 lecture at NobelPrize.org. Elinor Ostrom news, photos and videos from The Herald-Times, Bloomington, Indiana. Profile at the International Institute of Social Studies (ISS). Video of Annual Reviews Conversations Interview with Elinor Ostrom (2011).